Traceable product identification is one of the most important measures for ensuring the safety of medical devices. To this end, the U.S. Food and Drug Administration (FDA) approved a final rule for unique device identifiers (UDIs) in the early 2010s, with phase-in currently ongoing through 2020. Requirements began with Class III devices, which are subject to the strongest regulations and include products such as implantable pacemakers. Lower-risk Class II and Class I devices will ultimately be required to bear UDIs as well. In the European Union, the comparable Medical Device Regulation (MDR) also mandates UDIs for all devices. These UDI regulations are intended to resolve some of the issues stemming from risky devices that might have been flagged by more consistent screening processes. The FDA reported that the total number of product recalls climbed 97 percent between fiscal years 2003 and 2012, with the most consistent increases in the Class I and II categories, which are separate from the similar categorization scheme for devices themselves. Class I recalls – the most serious kind, involving products that could cause adverse health effects or death – later surged 88 percent year-over-year in the second quarter of 2017. Recalls have many causes, including labeling errors and faulty manufacturing. However, the most prevalent catalyst for something being recalled is now poor software design. A study by Stericycle Expert Solutions found that software-related issues were behind more than one-quarter of device recalls in Q4 2017, taking the top spot for the seventh consecutive quarter. Software can cause critical malfunctions, in addition to vulnerability to cyberattacks over IP networks. As the Internet of Things grows, medical devices will become even more interconnected with other IT systems, raising the stakes for timely, accurate identification of flaws. By scanning a UDI barcode, it’s possible to pull up a device’s date of manufacture, along with its lot and serial numbers. 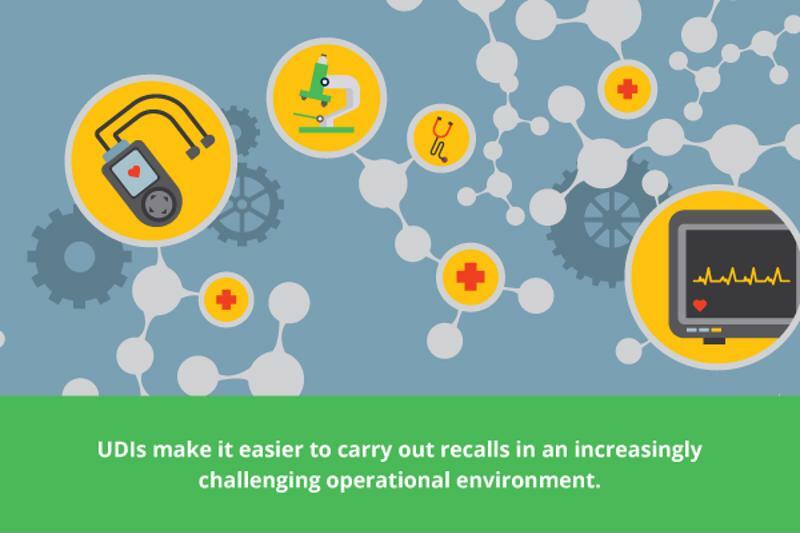 With this detailed and standardized information, manufacturers, distributors and healthcare organizations can search their inventories to find devices that meet the criteria for a recall (e.g., all models produced after a certain data, at a specific facility, etc.) and quarantine them. In 2015, the U.S. Office of the National Coordinator for Health and the Centers for Medicare and Medicaid Services issued a rule requiring the integration of UDIs into patients’ electronic health records (EHR). EHRs already provide extensive exchangeable data, and the inclusion of UDIs helps providers understand at the point of care what implantable devices in particular patients rely on. Accordingly, they can avoid mistakes stemming from misidentification or non-identification of these medical instruments. Medical device counterfeiting is a large industry with major ramifications for public health. The World Health Organization estimated that 8 percent of all medical devices in use in 2010 were counterfeit, using either subpar or toxic materials. The presence of UDIs can reduce the impact of counterfeiting. Devices with UDIs would be fully auditable, while ones without them wouldn’t be trustable at all. At the time of this writing, the FDA’s UDI requirements for Class III devices had already come into effect and those for Class II devices were only months away. Complying with these regulations is necessary, but not always easy. For starters, the direct part markers (DPMs) that constitute UDIs in the form of barcodes, QR codes or other identifiers must be readable throughout the imprinted device’s entire lifespan. That means that the imprinting process be high-quality and consistent, despite issues such as the lack of unified labeling solutions at many device makers. DPMs/UDIs must also be incorporated into broader supply chain management operations. They work in tandem with numerous readers and be matched with specific form factors and packaging options. For example, the UDI for a pair reusable surgical scissors will likely take a different shape than the one for an artificial heart valve. A holistic approach UDI implementation, spanning hardware as well as software concerns, is necessary to ensure consistent, compliant labeling. An experienced partner like Inspirage can provide the guidance, project management and technical expertise to update your SCM operations for evolving UDI requirements. Contact our team today to find out more about how we can help, or view our resource center to learn about our previous projects.